Description - The Red-Tailed Hawk is a large, stocky hawk that has a light and dark phase. The breast is whitish and the tail is rust coloured. Younger birds are duller and more streaked and lack the rust-coloured tail of the adult. The call is a high-pitched, descending scream with a hoarse "keeer". Distribution - The Red-Tailed Hawk breeds throughout North America and winters across the United States north to southern British Columbia. They inhabit deciduous forests and open country of various kinds including tundra, plains and farmlands. 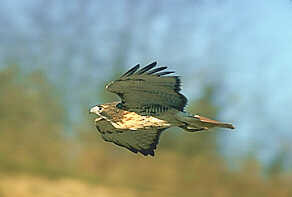 Biology - Red-Tailed Hawks soar over open country in search of its main source of food, the small rodent. 2 or 3 white eggs, spotted with brown are laid in a nest of sticks lined with bark and bits of green vegetation which is built in a tall tree or on a rock edge.